Two weeks ago I announced the quietest week of the year. Well I was wrong – last week was with a mere 33K of dough. This week the school holidays are over with a vengence and I baked my age in kilos – 64. It’s too much – 4.30 a.m. start, last customer 9.00 p.m.
A clutch of Laputabrods + three badly slashed wholemeals. Plus on Wednesday, in addition to prepping and mixing for Thursday, I baked 6 x 800g Multigrains for a one-off order + 16 Naan with garlic & coriander for a restaurant. Now I’m off to Brum for my brother Bernie’s 60th birthday party tonight and my mother’s 90th tomorrow. I’m giving my zimmer a polish. What a coincidence I had a similar day today. Its 8:34 PM and I am waiting for the last customer. I started at 3AM . Apart from bread, Vegan Bday cake, Apple Strudel, Bagels, Pretzels. I have lost count of how many doughs I had on the go today. Start again Sunday. Notice you are baking with Spelt. We used to but the price of Spelt has gone from around 14 RM per Kilo to 40 RM ( 4.75 RM = 1 Pound). Has it gone up over there? Do you know the reason? Wholemeal spelt is currently £1.67 per kilo as opposed to about 94p for white bread flour but white spelt which I don’t use is way more expensive. Apart from the fact that it is trendy I have no idea why it is so expensive. I used to bake a wholemeal spelt loaf but I wasn’t happy with the results. Now I just use it as a proportion of the flour in my 5 Seed loaf. Just having the word “spelt” in the name of a loaf increases bread sales! If I had a hat, I would take it off to you. That is some serious baking. I generally make quite a performance of making a couple of loaves let alone 92. I may well be in the market for your microbakery course in the new year Mick. Being a small scale baker is something that I do aspire to. Would love to have a better understanding of the practicalities. I do have that nagging fear though that turning a hobby that I am passionate about in to a job would take the pleasure out of it. Will never know if I don’t try I guess. I’ve been doing this for coming up four years. I’m 65 in February and I’m going round announcing my retirement party. I’ve had enough of the weekly bake in the form it is. I think your fear that turning a hobby you have a passion for into a job might ruin that passion is not well founded. From my point of view I know my attention span is pretty hopeless. Two/three years in a job is about my maximum. But I’m not talking about giving up baking. I’m talking about the grind of the weekly bake. 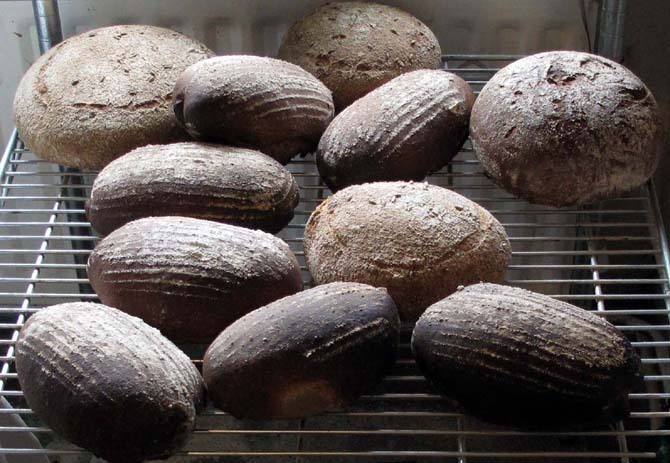 I want to develop teaching and writing and experimenting with bread in a way that I can’t do because I have to turn out a lot of bread (in my terms), in a particular way, in a tight time schedule. So seizing the opportunity to scale up your production shouldn’t destroy your pleasure in baking, it could lead to the next step in your baking experience. I totally sympathise with you Mick. I was 65 a few months ago. A few years a go I trained up a couple of young ladies to take over running the daily bake for a chain of organic shops. They now run that as their own business. I then went back to the UK, but was not particularly happy and we felt we had more freedom to do stuff over here (but we had to try). So we came back, to our property, tarted it up a bit and opened another bakery. the difference this time is we bake more or less when we want too which is 2 -3 times a week and all bread must be ordered and collected. We also opened a small cafe, where we hold small dinners for around 5 – 10 guests. this only operates on the weekends in the evening. This schedule suits us fine and allows us to do our other projects like translation, web design and gardening. Everything at our own pace. We must be doing something right. We have been in nearly every newspaper, magazine and life-style tv program described as living the “good life”. In my younger days I flew around the world every few weeks and had 3 companies to run. Today I have never been happpier.